Mid-March is upon us, which means that the shows and expos are slowly winding down while the fishing season is quickly heating up. Smallmouth are putting on the feed in the lower latitudes, steelhead are storming upstream on the West and Third coasts, pre-spawn muskies are on the prowl and brown trout are cracking streamers from Tennessee to Twin Bridges. You can count on the fishing to steadily improve for the next few months, but what you can’t count on is any stability in the weather. Even more so than the fall or winter, early spring can be a wildly variable time, sunny and spring-like one week and blizzarding the next. But it’s also a time of great opportunity—first fish of the year are on the horizon for many anglers, and that’s one of the sweetest things there is. For procrastinators, it’s also your last chance to reassess gear, trade in those fly rods you know you haven’t used in years, replace worn-out items before they fail you on the water, maybe grab a choice item or two that can serve you well not just this season, but for seasons to come. Below we’re presenting a mix of general and specific recommendations that have worked well for us during these last few months. The items on this list will serve you well for the colder months of fall, winter and spring, and may well help you extend your days on the water and your fishing season in general. Let’s start simply but meaningfully by talking about the throat area, which plays a surprisingly pivotal role in thermal regulation. Having an assortment of neck gaiters in both winter (wool) and summer (polyester) flavors will help you micromanage your core temperature over the course of a fishing day—and season. If you’re heating up, removing a neck gaiter feels like downing a glass of cold water. Conversely, if late-afternoon shivers set in you can throw one or even two around your neck. In ultra-cold conditions I’ll sometimes throw one on bandana style underneath my hat or hood. The best part about neck gaiters is that is that they can be crammed literally anywhere, and can save the day when the sun peaks out for a few burning hours and you’ve forgotten sunblock. 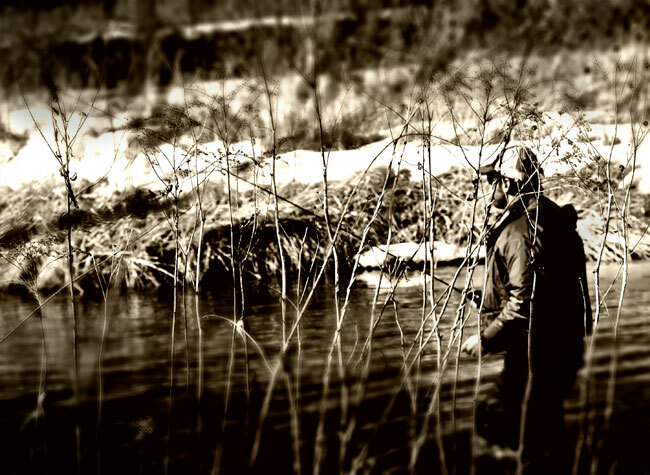 For me, cold weather fishing is synonymous with working quality water slowly and meticulously. But all that standing around in cold flows makes stockingfoot waders a less-than-perfect choice for staying warm. For years I’ve hunted for and failed to find a pair of breathable bootfoot waders that met two key criteria: fit my feet, and actually existed in this universe, not the black hole of eternal backorder. I got into the habit of buying disposable neoprene waders for winter steelheading but they were laughably delicate—a walk through brambles would turn them into a colander—and I eventually grew tired of throwing money down the drain. I lamented this fact to my friend Jerry Darkes and he recommended I try Aquaz. It was a brand only peripherally on my radar, but after a few months with the waders I’m happy to report that their Dryzip Bootfoot has exceeded my expectations. The first thing I’ll comment on is the build quality, which is very, very solid. As the name indicates, these waders have a zip-up front, and that zipper is both beefy enough to inspire trust and big enough to grip with cold fingers. Elsewhere, the waders are reinforced in all the right places—with plenty of extra material around the knees. Then there’s the raison d’être of bootfoot waders: the boots themselves. On their entire line Aquaz uses those manufactured by the Bogs company, which are well insulated and as supportive as you’re likely to get with a pair of bootfoots (ankle stability being one of the compromises you inevitably have to make if you want to be truly warm). If you wear an orthotic in your civilian life, you can do so on the river as well—just remove the Bogs inserts and replace them with your support of choice. In terms of traction, the boots are good though not great, but that’s an easy fix via any one of the cheap mountaineering crampons on the market. On a related note, I’m also told that next year’s model will feature a sole that accommodates screw-in studs. A few words on sizing your bootfoots: I wear a size 11 street shoe and always take a size 12 wading boot with my stockingfoot waders. When it came to the Aquaz Dryzip, I stayed with the size 12, and it turned out to be the right fit: stable with just a bit of extra room (it’s that extra room that gives you a space to build up heat). If your bootfoot is a little on the large size, just fill in the extra space with extra-bulky socks, or a combination of socks and a wicking liner. If you’re going to overheat, it’s not going to start in your feet. The Dryzip Bootfoots don’t come in all the sizes under the sun (unless you place a custom-order, which I didn’t), meaning that size 12 boot also meant an extra-large wader everywhere else. I generally take a large and thought the extra material might be problematic, but if anything I actually found the extra interior space to be surprisingly useful. First off, I had the option of wearing everything (including an insulated wading jacket) inside my waders, which definitely kept me warmer. Then I used the slightly open area above the wading belt as a staging area—gloves, an extra buff and a fly box sat there ready to go. That said, when dealing with serious precipitation you’ll want to go the normal route of wearing some sort of waterproof shell on the outside and over the waders. Final verdict: these waders will afford you near-summer comfort on the cold days of fall, winter and spring. If you’re never walked around on a frigid day with warm feet, it can feel a bit like flying on a plane for the first time. By which I mean you’ll stand there wondering: How is this even possible? When it comes to the actual fishing, long rods (those in the 10-11-foot class) make a lot of sense for a number of early-season applications. First off, between snow melt and spring precipitation, many river systems will be mildly to severely stained for an extended period of time—a great time to experiment with short-line nymphing, since you can get close enough to make ultra-precise presentations, especially on the gloomy, drizzly days so characteristic of the early season. As someone freshly rehabbed from a shoulder injury, I can tell you that short-line nymphing with a ten-foot rod makes a world of difference on your body, since it’s actually a very physically demanding presentation method. But it can be well worth it, particularly during the middle part of warmer days when fish actively push into faster runs. Take note that short-line nymphing isn’t only for trout. Spring run steelhead also make a great close-quarters quarry, though’ll you’ll want to arm yourself with a heaver stick, like a 6-weight switch rod (and make it a fast or even ultra-fast action rod, which will be more immediately responsive to a take). My favorite rod for this particular application, Sage’s TCX 6119, is no longer on the market, but many fast-action rods in the 10-12-foot class will fit allow you to present the fly well while absorbing the power of a surging fish (depending on the size of the fish in your system, a 7-weight may also make more sense). If you’ve never hooked up with a fresh chromer just a few feet away from you in quick water, that initial surge is something you’ll always remember. It’s also a great way to make sure your knot tying skills are up to snuff. Long rods have a place in warmwater fishing, too. The classic indy steelhead 10-foot 7-weight makes a great early-season smallmouth dredging tool. Before water temperatures hit the magically metabolic 50-degree mark, you can still make regular contact with smallmouth by fishing aggressively weighted, sparsely dressed leech patterns (best tied on a jig hook weighted so the hook point rides up) on untapered leaders along deep, slow-current shelves. You’ll want the the line to be drifting along just downstream of the boat, with a slight belly in the line that will aid in strike detection. Use your mends to keep your drift on point and impart a regular bump to your fly—that bump will keep it from hanging up on the bottom and will also grab a smallmouth’s attention. Think of it as nymphing meets jigging. Jymphing? Whatever you want to call it, a long rod will help you stay in that early-season smallmouth sweet spot: that ultra-slow, super-cushy deep water in coves and eddies just off the main current flow. I was doing a radio interview in early January and the host of the program, a non-angler, was a bit taken aback when I citing overheating as one of the major challenges of fishing in the cold. But it’s a fact that if you sweat too much into the wrong materials, you’ve got a sure-fire recipe for a cold afternoon. In low temp conditions, natural materials outperform synthetics by a large margin. Enter the sheep. The heyday of wool, especially American wool, is now. One newer company that’s impressed me over the last year is Voormi, a Colorado-based mountaineering brand that occasionally collaborates with Fishpond to bring specific products to the fly fishing market. Though not part of any official fly industry collaboration, their Thermal II Baselayers are perfectly suited to anglers that need to hoof it through the cold without overheating. Voormi sources and selects its wool fibers to be extra crimpy (for better insulation properties) and and extra long (for extra durability). On top of performance, Voormi wool is butter-soft and silky smooth. One thing I’d recommend: order one full size up from your regular size in both the tops and the bottoms. This form-fitting wool definitely runs a bit small compared with fly-trade sizing patterns. While beer is an attractive summertime companion, it won’t do you any thermal favors in the middle of a cold spring, fall, or winter day (except, perhaps, in mulled form). Hot liquid can work wonders during on a cold day on the water, breathing new life and flexibility into your casts and mends. One new thermos option you might not have heard about comes from a relatively new brand, AVEX. Their 3SixtyPour brings a few new and very useful features to the thermos market. First off, it features a spout system that allows you to pour without exposing the bulk of the interior liquid to the air, thus minimizing temperature loss while pouring. A second welcome feature is the cup itself—unlike many other thermoses, the cup is aggressively insulated, which means you can hold it without burning your fingers and keep your beverage hotter longer not only in your thermos, but in your hands. Lastly, the cup is also just a hair taller than my Stanley cup, which makes it a better car thermos—you won’t need a crowbar to fish your cup out of the holder. When it comes to transmitting useful light to the eyes, the unique challenge to early season fishing has less to do with blocking light and more to do with bringing just the right amount in, polarizing it on the way. That’s because the early season is an optical adventure in the monochrome—dull and monotonous, at least until that Oz-like moment when you pull a brightly colored fish from the gloom. In your early season glasses, look for a polarized lens that admits more light than your summer lens and possesses a tint somewhere in the yellow spectrum—the best color for heightening contrast in the dull gloom of late winter and early spring. Smith’s Low Light Ignitor fits this bill to a T and is now available in a Rx form for those who don’t like juggling contact lenses.